The Four Corners Gem & Mineral Club sponsors occasional field trips to destinations of interest to our members and guests. View the calendar of events for upcoming field trips. This page features recommended outings in the Four Corners region for rock hounds and geology buffs. There are several compelling but rarely visited destinations to explore in northwest New Mexico, including Bisti, De-Na-Zin, and the Ah-Shi-Sle-Pah Wilderness Areas. The Ah-Shi-Sle-Pah Wilderness Study Area (WSA) discussed here is located in a sparsely inhabited high desert region, characterized by flat arid terrain and sandy washes. Prominent in this otherwise bleak landscape are highly eroded cliffs lining the valley walls, colorful badlands, hoodoos, balanced rocks, and other strange rock formations sculpted by the elements. 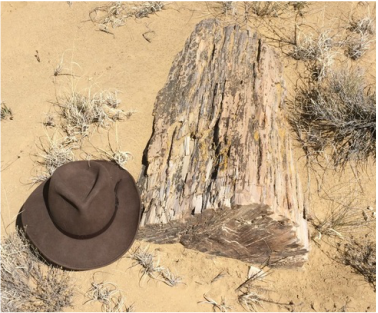 As with the other Wilderness locations mentioned, petrified wood is abundant here, sometimes found in upright positions, sometimes with roots completely exposed. Bisti Wilderness to the north has many of the same geologic and fossil features. Collecting is not permitted in this area. Word of caution – Travel in this area can become treacherous during rain storms; travel is not advised if rain and high wind forecasts are posted. There is no cell phone coverage. Be sure someone knows where you were headed and when you are expected back. Driving directions - From Bloomfield, NM, travel south on New Mexico State Highway 550 approximately 25-30 miles to the Blanco Trading Post (now closed, 2016). Turn right heading southwest on Road 57; the first 5 miles is paved but full of deep potholes and depressions, drive slow and take care in driving, deep potholes could rip your tires and demolish your suspension. The dirt road thereafter is in better condition, however be cautious after snow melt or rain storms and do not drive through washes if water crosses the road. Road 57 is the old north access route to Chaco Canyon which is now closed at the park boundary. The Ah-Shi-Sle-Pah Wilderness Study Area is approximately 13 miles from Highway 550 on the right side of the Road 57. Total driving time from Durango is 2.5 to 3 hours one way. What to take - Camera, hat, wind breaker or rain jacket, lots of water and snacks, sun block. These sandstone, mudstone, and shale layers from the Fruitland Formation are very colorful, from the brown-ochre tones of the badlands to yellow-orange rock formations and hoodoos, as well as light gray mud hills, charcoal colored badlands and occasional coal seams. Fossils include petrified wood and many animal fossils, including dinosaur bones and early mammals. Again, no collecting is allowed. During the Cretaceous Period, the San Juan Basin is believed to have been a beach/marsh complex resembling coastlines such as modern Louisiana or the Carolinas today, with land to the west and inland sea to the east. Palm wood is common throughout the San Juan Basin as are dinosaur fossils of both herbivore and carnivore species.